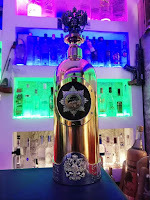 Home » crime , lifestyle » The ‘World’s most expensive’ bottle of vodka (worth $1.3m) gets stolen from a bar – See PHOTOs. The ‘World’s most expensive’ bottle of vodka (worth $1.3m) gets stolen from a bar – See PHOTOs. The ‘world’s most expensive’ bottle of vodka has reportedly been stolen from a bar in Denmark. The alleged theft happened at Cafe 33, a bar in Copenhagen which displays a collection of rare vodka bottles. The bottle that is worth $1.3million (coated with gold and silver) was featured in an episode of the popular drama, House of Cards. “Help. Someone has last night been inside “with key” and stolen my vodka russo baltique vodka which is the world’s most expensive vodka $ 1.3 mil.”Reward is given to those who can help find it.